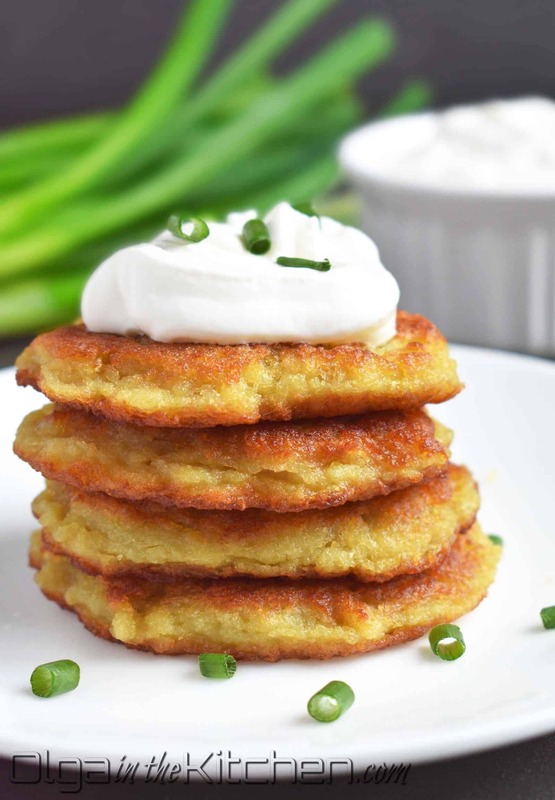 These are classic Ukrainian Potato Pancakes also called Deruny. Serve for breakfast, as an appetizer or side dish. Always serve with sour cream. An easy recipe that takes around 30 minutes for the whole process! 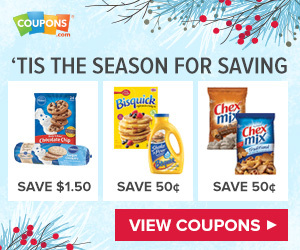 If you love pancakes, try these other recipes: buttermilk pancakes and cheese pancakes. 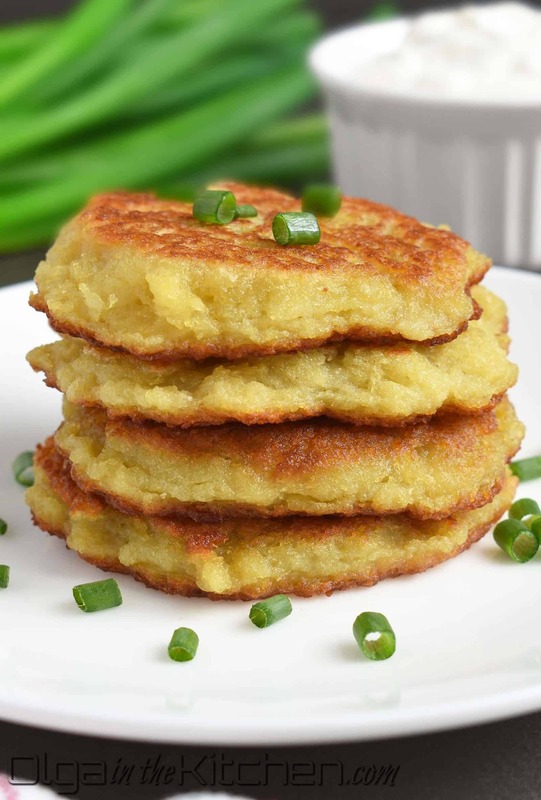 There are many varieties of potato pancakes that come with different names. 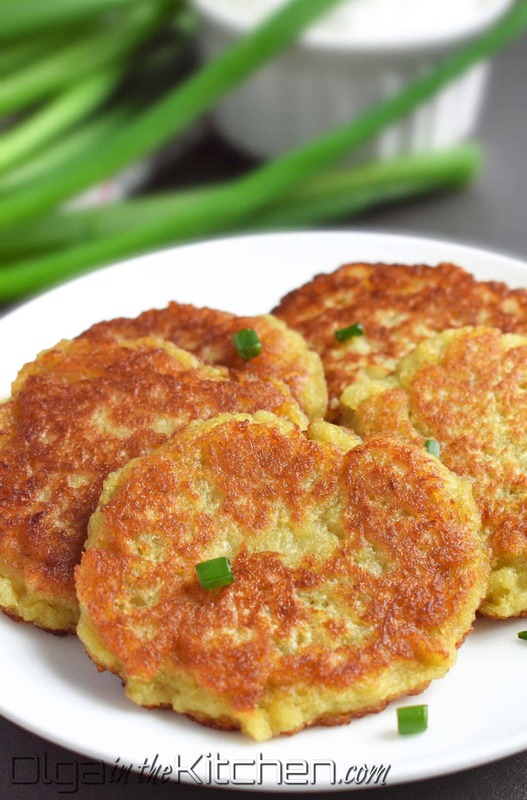 In Ukraine they are prepared from finely grated potatoes and onions, along with eggs and salt. 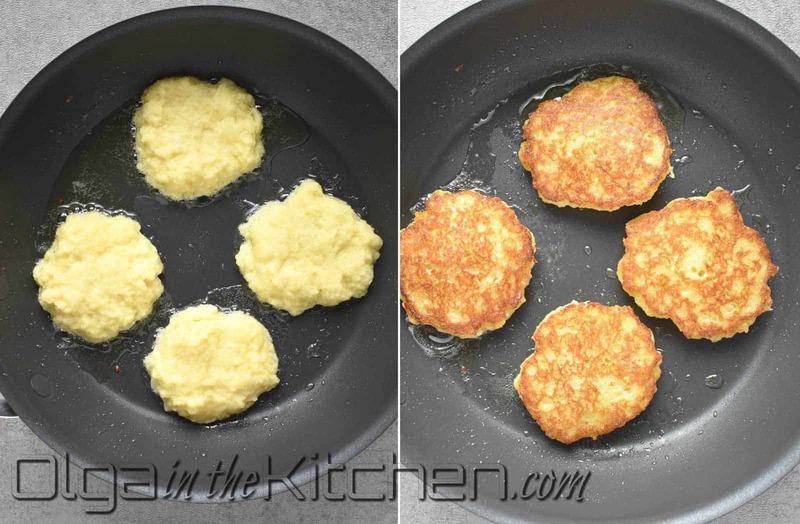 My mom always added a bit of baking soda as well to turn these into fluffy pancakes. 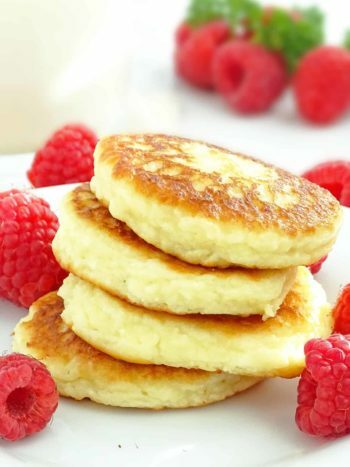 These Ukrainian pancakes are called Deruny and are very popular among Ukrainian families. Deruny are usually served as main no-meat dish either for breakfast or lunch, sometimes dinner. Even though these are delicious enough on their own, a lot of times they are served as a side dish for main dish or along with salad. My family always loved them with a dollop of sour cream. What Tools or Appliance I Need to Make Deruny? 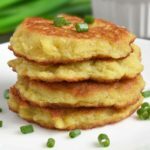 Why use Grapeseed Oil When Frying Potato Pancakes? I love using grapeseed oil in cooking. It’s a bit on the pricier side, but it makes cooking tastier. 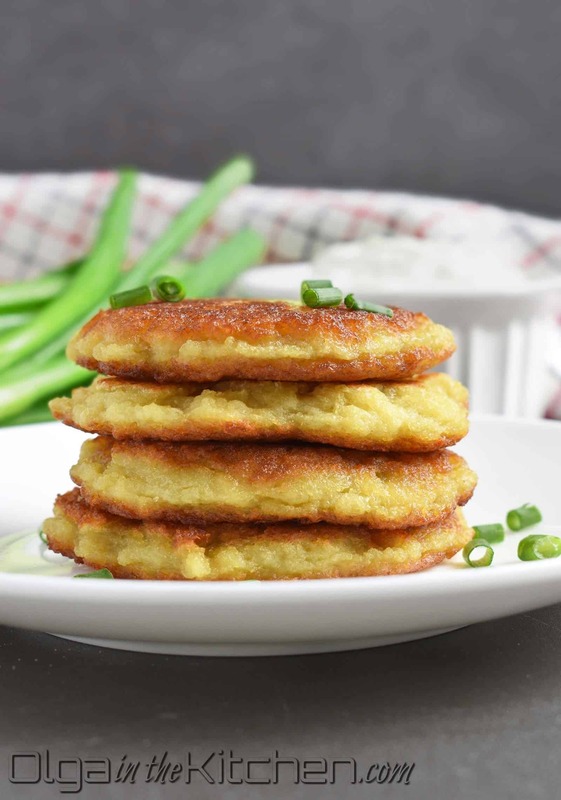 When it comes to recipes like potato pancakes, I always use grapeseed oil or sunflower oil. Why? Both of these are healthier, light in taste and they don’t add any excess oily taste to pancakes. Deruny like to absorb the oil quite a bit when frying. When you use vegetable oil or canola oil, they tend to overpower the potatoes and leave that excess oily taste. I can always tell the difference and the pancakes are less enjoyable then (at least for me). We had always used Yukon gold potatoes for Deruny. In fact, we always use gold potatoes. No one in our family likes russet or red potatoes in meals. Gold potatoes turn out better in texture and color and they don’t brown as quickly as russet. The only time we use russet potatoes are for baked potato wedges. 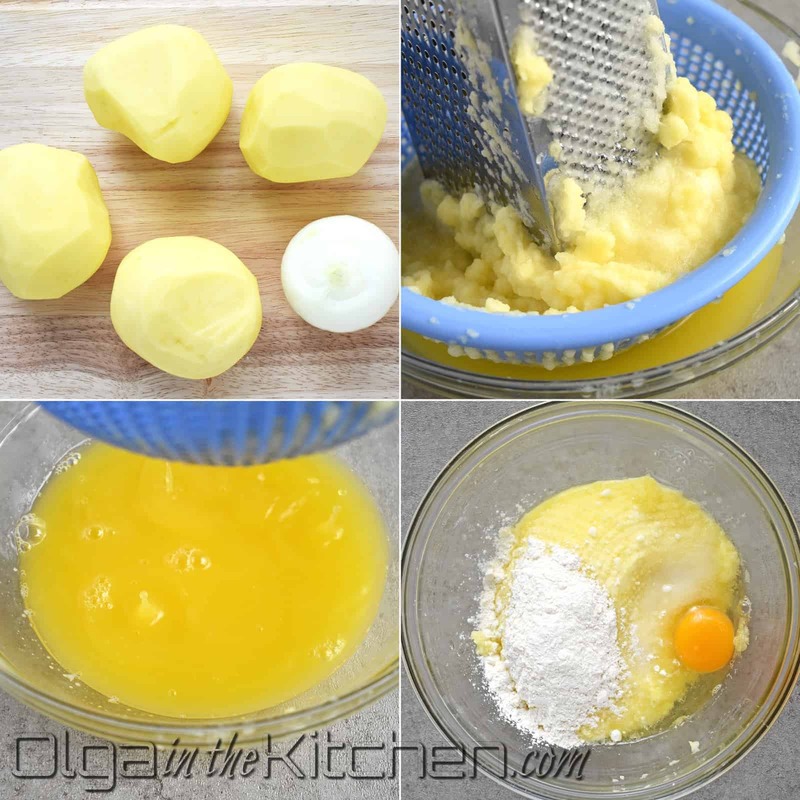 Use regular yellow onion and not sweet. I add a teaspoon of fine salt which is the perfect amount for the amount of potatoes. You can also reduce the amount by half and they will turn out more bland, but with a dollop of sour cream – the taste is also perfection! Potato batter will be thick, but still liquid enough to spoon. Serve deruny warm with a dollop of sour cream. Peel 4 large Yukon potatoes and 1 small yellow onion. Line a sieve with a large bowl so that potatoes will drain while you finish grating. Into a sieve, grate potatoes and onion onto the star-shaped hole on grater, taking turns. Onion juice will prevent potatoes from browning. 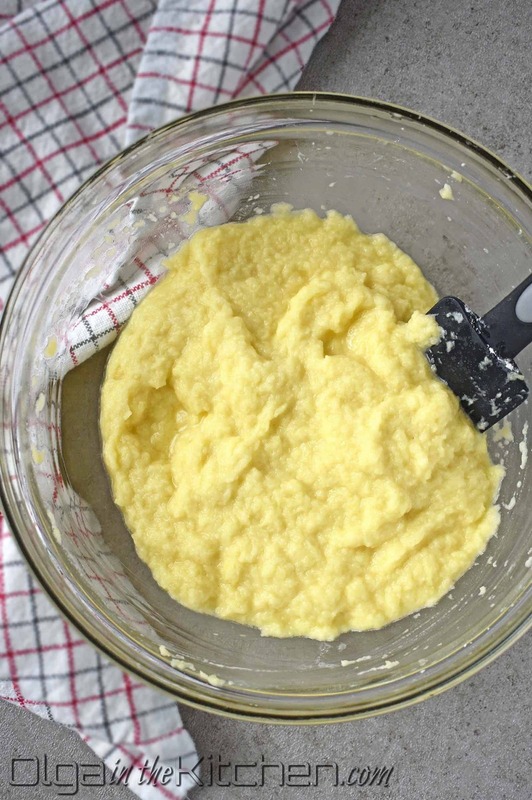 Dispose most of the potato juice from bowl underneath the sieve, but do not wash the potato starch. 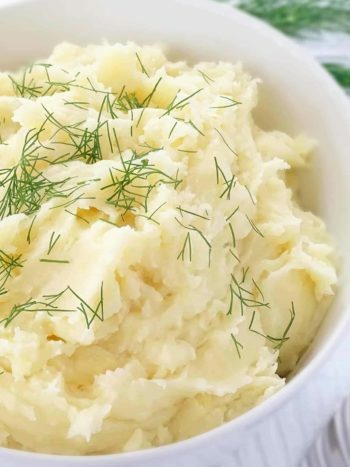 Keep the potato starch and add the grated potatoes and onions to the bowl with starch. 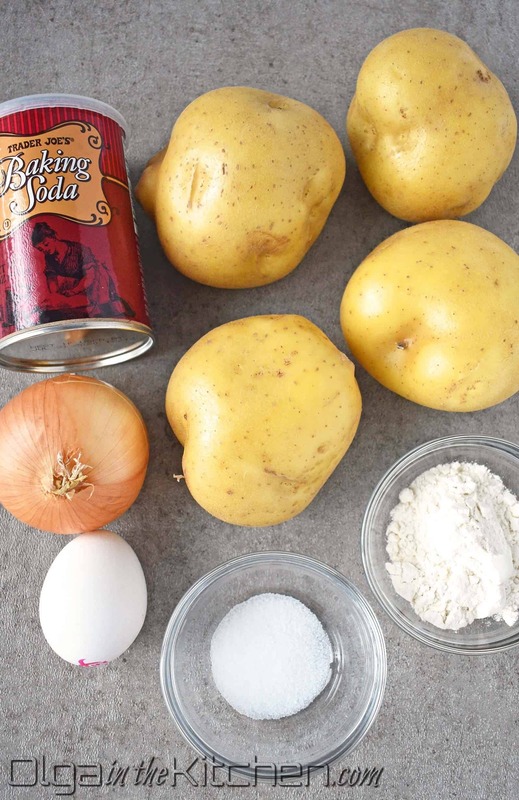 Add 3 tbsp all-purpose flour, 1 egg, 1 tsp fine salt and 1/4 tsp baking soda into the potato mixture. Mix well until incorporated. Potato batter will be thick, but still liquid enough to spoon. Heat 2-3 tbsp of grapeseed oil in a large nonstick skillet over medium heat. Spoon 1 heaping tablespoon of potato mixture to make pancakes, about 1” apart. Fry on each side until golden brown (about 3-4 mins each side). Repeat the same procedure for the remaining batter. 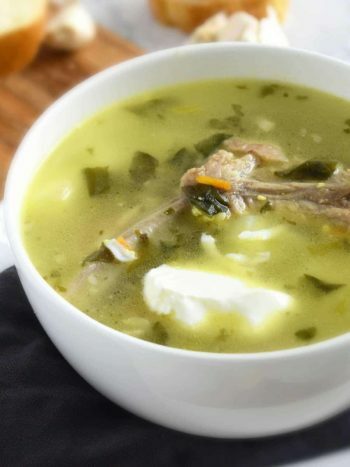 Serve deruny warm with a dollop of sour cream. The fact that this is 30 minute meal is my favorite. It probably took me 20 minutes to make these, Kids loved these and I have a feeling these deruny will soon become the breakfast staple at our home. Thanks Olga! Seriously the best breakfast I’ve ever made! I used my muscle to grate this and took turns with my sister lol but boy these turned out so good. Another great recipe from you. Please clarify what is the potato starch . Do you mean to add the grated onion and potato, back into the drained fluid?